--A.E. Waite, The Pictorial Key to the Tarot. 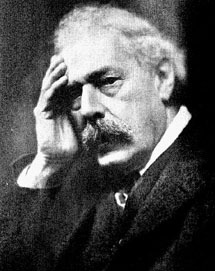 Arthur Edward Waite was a mystic, a scholar, a member and, after the expulsion of S.L. MacGregor Mathers, the leader of the Golden Dawn. Waite’s early interest in the esoteric turned fully to the tradition of western hermeticism and the occult when he discovered Levi’s writings in the library of the British Museum. Not only was Waite the eventual English translator for Levi’s work but he was also the first person to write of the occult tradition as its own unique and cohesive spiritual tradition we could take something from, instead of a disparate group of beliefs or practices that all served as a kind of combo proto-science/religion. Waite was also an early influence and mentor to another important figure in the history of Baphomet, Aleister Crowley...before the two became enemies—an enmity mostly due to mean-spirited but extremely funny reviews of Waite’s work and Crowley’s later insistence on referring to him as “Dead Waite” due to his incredible dullness. Today, however, Waite is best remembered as the man behind the Rider-Waite Tarot deck. This fortune telling device is still available today but its claim to fame rests firmly in the fact that it was one of the first decks to illustrate every single card, not just the 22 Major Arcana. And for our discussion here, for making Baphomet synonymous with the Devil. The Rider-Waite deck was illustrated by an American artist named Pamela Colman Smith. She was friends with William Butler Yeats who introduced her to The Golden Dawn, which is how she met Waite. 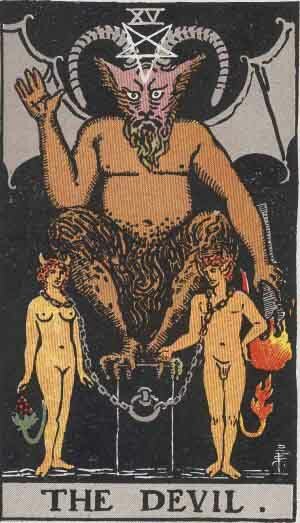 For the Devil card redesign, Waite directed Smith to Levi’s Baphomet for her inspiration. Prior decks tended to feature “devils” that were either more clearly meant to represent Pan or a satyr, or were simply inspired by Hieronymus Bosch and his penchant for grotesque body horror as punishment for sin and excess. Previous illustrations kept more fully to the basic meaning of the card. The card has nothing to do with a sentient force of preternatural evil. The card represents the problem we have with our own passions, our tendency to ascribe our actions as being dictated by outside forces when we actually are the ones in control. Regardless of the card’s actual meaning, the choice of Levi’s art paired with the name, cemented Baphomet’s association with that supposed, sentient manifestation of evil.